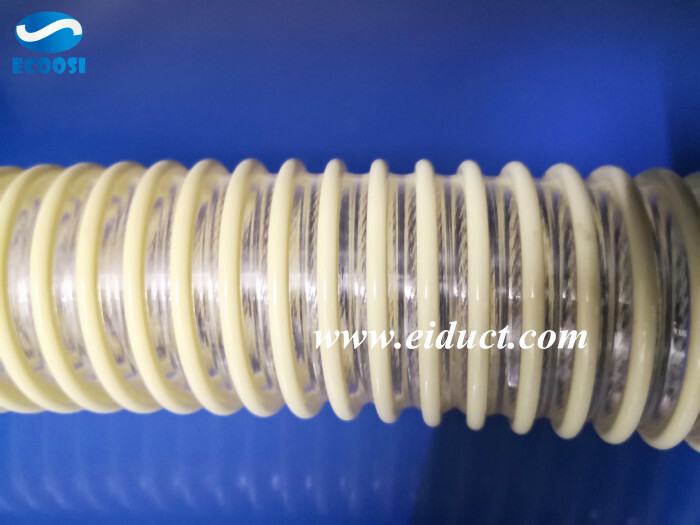 Ecoosi material handling flexible PU antistatic ducting hose generates a lot of friction, resulting in static buildup. When the material moves through the antisstatic PU flexible ducting hose, the accumulated static charge will occur on the moving wheat dust or individual particles of the wood vessel. This is because the dust particles are constantly moving and colliding with each other. When this occurs, the one-point charge is transferred from one particle to another. If the process lasts long enough, you can have multiple differences across the grain container. This is sufficient to cause an electrostatic discharge like lightning, and if the dust is combustible (e.g., wood dust or grain), then a very strong explosion may occur. This is the exact situation where the Ecoosi flexible PU anti static material handling hose is designed for protection. Due to the risk of static electricity, it is important to use our flexible PU anti static hose to ensure that the hose maintains maximum airflow and reduces the risk of fire damage. Ecoosi offers material handling flexible PU anti static hose designed to efficiently transport materials and prevent static buildup. Our static dissipative flexible hose is made of specially made hose materials that allow the hose to transfer large amounts of material without creating static. This is ideal for applications such as carpentry where ducting hose prevent the build-up of static electricity to collect wood dust and produce sparks of combustible dry wood material that may cause fire. Anti-static flexible hose is used to prevent accumulation when the hose is firmly grounded and connected to ventilation. In addition to the ability to prevent static buildup, Ecoosi's PU static flexible suction hose is also very durable. Our flexible PU antistatic ducting hose is made of polyurethane, to provide excellent resistance to external abrasion. The anti-friction properties of polyurethanes provide a tough surface that greatly reduces the potential for static buildup in flexible ducting hose. 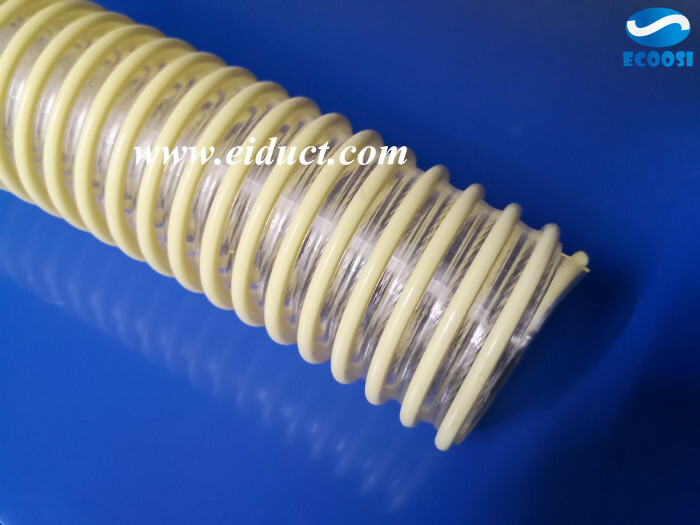 Since grounding is critical to the use of the product's antistatic properties, it is also important that the hose is flexible. 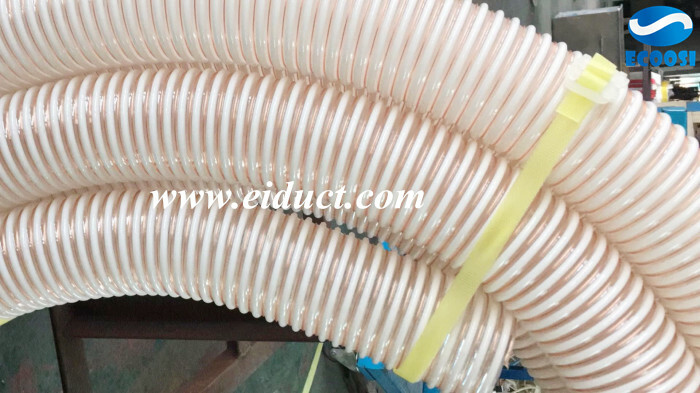 Ecoosi's PU static elimination flexible hose is very flexible and you need to keep the curved ducting hose grounded to the necessary material without sacrificing air flow or static buildup. 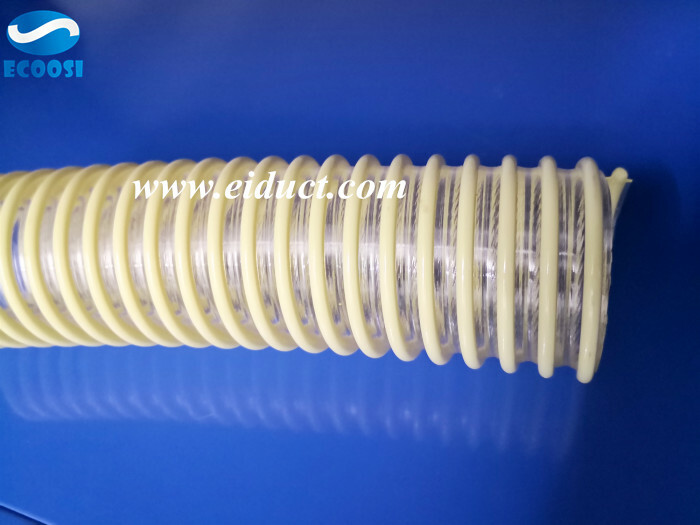 Ecoosi material handling flexible PU antistatic ducting hose From Ecoosi Industrial Co., Ltd.
Pre：What is HVAC? 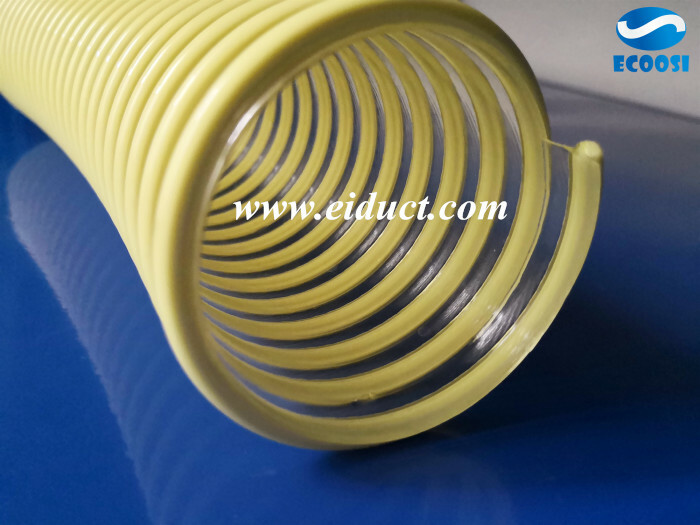 Next：Industrial Flexible Ventilation Ducting Hose From Ecoosi Industrial Co., Ltd.